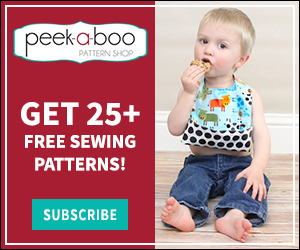 Jogging Stroller Cover Tutorial - Peek-a-Boo Pages - Patterns, Fabric & More! Stroller covers can be expensive! So… I decided to make my own. I love the little window that can be open or shut and that it works on my jogging stroller and my regular stroller. 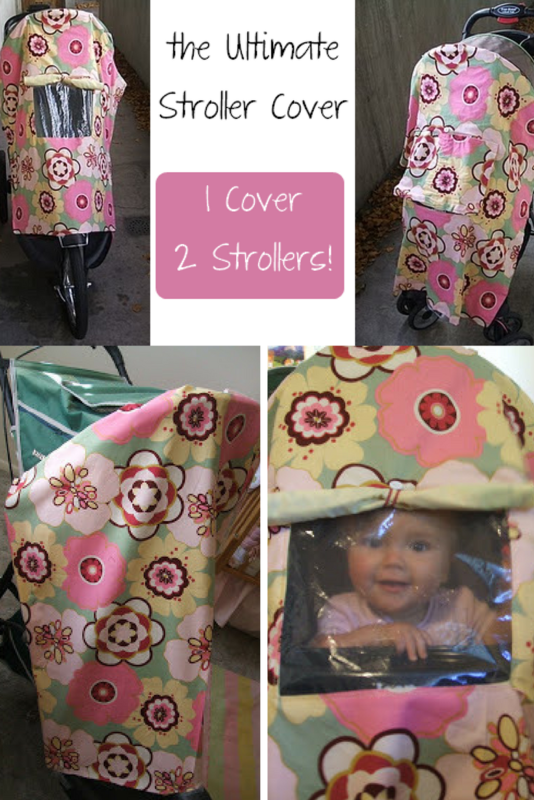 Enjoy the Ultimate Jogging Stroller Cover Tutorial! 1. Strollers are all shaped a bit different, so there’s no pattern for this project, but it’s pretty easy. Drape your fabric over your stroller (if you want this to work on a jogging stroller and your regular stroller make all the measurements for the jogger) and pin until you get the shape you want. I tucked under quite a bit of fabric at the top to make a curved edge and then it tapers down to the bottom. The overall shape looks kind of like a coffin. I only used 1 yd of fabric and I wish I had gotten a bit more. The bottom of my cover is straight, but I would recommend making a rounded edge along the bottom to get better coverage on the jogging stroller footrest. 2. Fold your pinned fabric in half and use it as a pattern piece to cut your lining. Now unpin the main piece of fabric and use the lining piece as the pattern to cut your main fabric. You will need some fabric leftover to make the window cover, so don’t cut right out of the middle of your fabric! 3. Fold your fabric in half and cut out a window. It needs to be about 1″ smaller on all sides than your plastic piece. 4. Fold back the raw edges from the window and stitch down. Do this on your main piece and the liner. 6. Slide the window in between your main piece and the liner, so you have a nice sandwich. Top stitch it down with a zig-zag stitch. 7. I made a window flap for mine to make naps in the stroller a little bit easier for little miss. 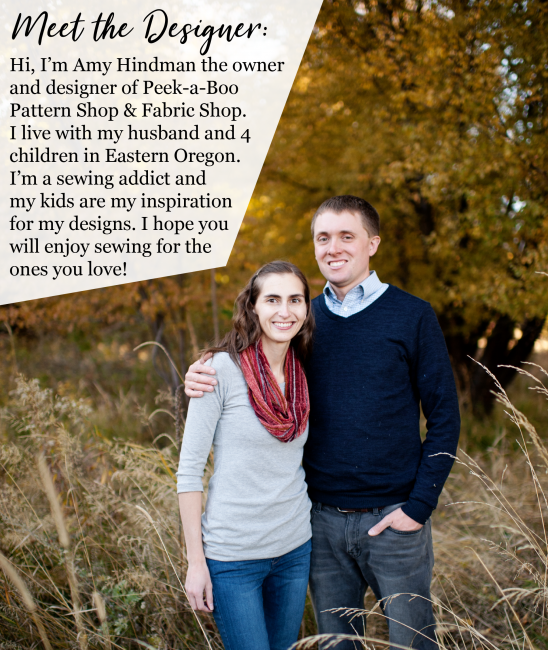 Cut a piece from your main fabric and your liner that is about 1-2″ bigger than the window. Place RST together and stitch almost all the way around. Turn right side out through the opening you left. Tuck the edges in and top stitch shut. Get your flap in place over the window and then top stitch it onto the cover. 9. Sew buttons onto the stroller canopy and add buttonholes to the top of your cover. I did 4 and it works great. 10. If you are making this for a standard stroller I recommend adding ribbon ties along each side and at the bottom. Otherwise your baby will try to tear the cover off. For the jogging stroller you will need to secure it in a few places where there’s nothing to tie a ribbon to, so add some velcro instead. 11. Hot glue velcro onto the jogging stroller. This is the best way to attach the cover to the wheel well/foot rest area. I added some to the legs too, but ribbon would work fine there. 12. I learned the hard way that velcro isn’t quite enough to hold the cover to the very front. So… I added a piece of elastic that slips into the wheel well. It should be just long enough that it stays down, but isn’t rubbing against the wheel. I like having the velcro there too for extra hold. Finished! Don’t you love it? And it makes a nice little fort for your baby. Love your tutorials! I just want to say that parents have to check in on the baby often when the stroller is covered. Where I live, health professionals strongly advice all new parents against covering strollers with blankets or tight rain covers. There is a risk of re-breathing CO2 and overheating, and both may be dangerous for the baby. I realise that the cover in this tutorial is intended for cold days, but the risk of high CO2 levels inside the stroller will still be there, as far as I know. P.S. For those of you who would like to go waterproof with this, you can get Phthalate Free Vinyl at Joanne’s Fabric and Craft stores. I found out from their corporate dept that all of the vinyl that they carry is Phthalate Free! Essentually, you could just use that to make a clear cover for rainy days if you wanted to (with some colorful binding around the edges!). I would think that it would’nt be good for the warmer weather, a bit too stuffy for baby. I just now found this post and I’m SO GLAD!! I’ve been wondering how I can keep my daughter out if the sun when I go out, and now I’ve found it!! Thank you! Wow…this is brilliant! Great job. This is great. If you use oil cloth for the outside fabric you wouldn’t have to worry about the waterproof element and could stay out in the rain as long as you wanted. Thanks for sharing the great tutorial. Ooooh but my babies just great up and out of strollers – no fair this is just too gorgeous! Fantastic tutorial! I especially love the last photo. I’ve seen covers before but never with a window. Genius! i so wanna make this!!!! What a great idea. I wonder if you used laminated fabric if it would work even better in the rain too! Our stroller used to have one of these covers but I love the fabric that you used. What a great tutorial! You did an amazing job! Very cool idea. My sister used to run with her boys in the stroller even in the winter, so they would get all bundled and padded and the blankets were always falling off, this would have been perfect.